Depending on your skill level and experience, the best Sudoku books will be different for each puzzler. The perfect puzzle will be challenging but not too hard, and still take you a decent amount of time to get enjoyment out of it. That’s what I think at least. In this Sudoku book review post I’ll cover some really great options for puzzlers ranging from beginner to advanced, and also give you some tips and resources for solving your Sudoku’s. 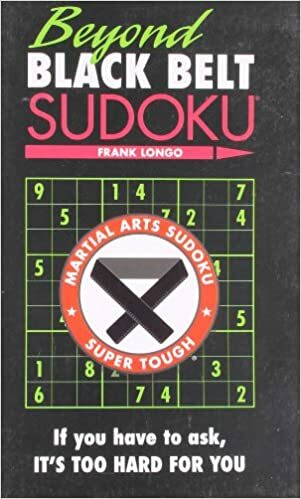 Difficulty – As mentioned briefly above, the best Sudoku books will challenge you and take you a good amount of time but not be overly difficult or too easy. There’s no other way to gauge the difficulty and your experience other than trying out a few puzzles to see where you stand. Length – In my opinion, the longer and more puzzles the book contains the better. Bonus points for if it has different difficulty puzzles in the same book so you get some variety and can change up how hard the puzzle you solve is. Also multi-difficulty books are great for books that are in shared households so that everyone has a Sudoku difficulty they can complete. Size – Typically as we get older, our vision decays and some may already have vision issues. Some Sudoku puzzles are smaller than others and not very friendly to those with vision problems. If this is an issue for you or whoever you’re buying a Sudoku puzzle for, be kind and buy them a larger book or one that isn’t super-small. Price – In a world so dominated by the dollar, how can we forget about price? We always want the best bang for our buck so the more puzzle per dollar the better. Materials & Sustainability – Finally we look at the materials the book is made up of, and how those materials were sourced. If you’re concerned with environmental sustainability then you could opt for book options that are conscious of those issues. 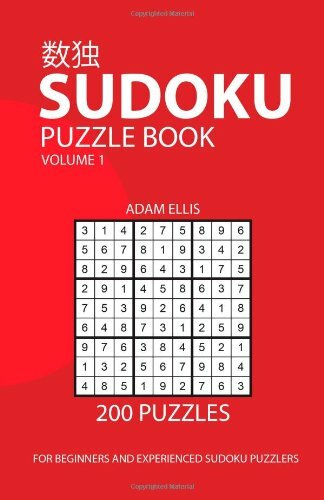 This is one of the standard Sudoku puzzle books that I recommend to anyone with a bit of experience looking to get into solving Sudoku regularly. It has 50 of each difficulty including beginner, novice, moderate, and advanced. My only complaint with this book is that it’s a little bit small and tight for writing anything additional around the puzzle, and reading the puzzles reflects that. Overall a great Sudoku book with 200 puzzles that are fairly difficult for a few bucks. Next up I have a slightly more difficult 300 puzzle book for you to check out. This is very similar in puzzle amount, and price to the Volume 1 above but the puzzles are a fair bit more difficult. If you feel you’re getting past the more tame puzzles commonly found in the news or simple books, then this would be a great option for you. 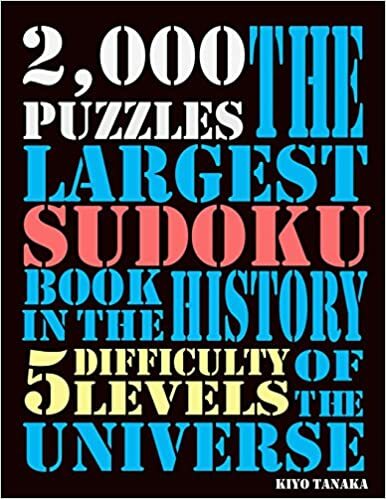 All of the 300 puzzles in this book are rated “hard” and I found most of them quite enjoying as a novice-intermediate Sudoku solver. I would not recommend this for a fresh beginner. This option is included on the list for it’s daily challenge appeal. With 366 puzzles it gives you a challenging Sudoku for each day of the year. Will you stay on track of fall behind? This type of book is great for engaging your brain every single day and a great gift. Of course in the end it’s still a book of puzzles so if you don’t do it on the specific day it’s not a great deal. I like this book because of the 5 ranges of difficulty, easy/moderate/nasty/cruel/deadly and it’s larger size. The puzzles are very comfortable on your eyes, and there’s plenty of room for notes and side-work. 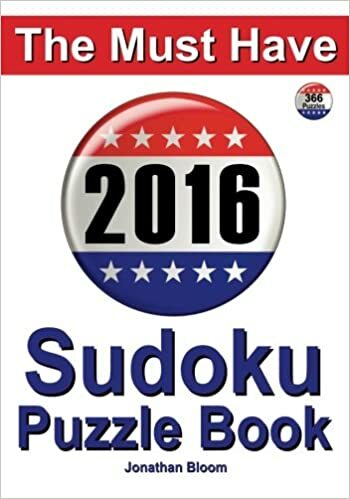 I would recommend this book for those with experience solving Sudoku’s, or as a gift for the puzzler in your family or friend group. This book makes the list for pure value. With 5 difficulties ranging from beginner to expert, this 2000 puzzle book gives you insane value with more puzzles per dollar than any other book I’ve found. The difficulties are spread out evenly and a beginner, intermediate, or expert can pick this book up and have fun. I recommend this book for a family of Sudoku solvers, or as a long-lasting gift for a beginner. With plenty of puzzles ready to solve in each category you’ll be Sudoku-ing forever! The font used is a nice size, and this book has a lot of room for solving which is great. So you think you’re good at puzzles and Sudoku? Try this book and talk to me again. A lot of Sudoku books, including some on this list claim to be difficult but end up not being that hard in the end. The Beyond Black Belt Sudoku book delivers on this front, fantastically. I whole-heartedly agree that this is one of the most challenging Sudoku books ever printed and it definitely will not disappoint. The sizing is not great on this book but sacrifices must be made for top-tier difficulty puzzles, right? 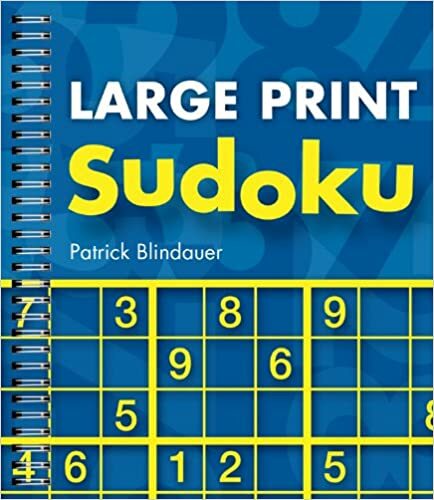 With a lot of complaints on the size of Sudoku books, numbers, and extra solution-space I’ve included this large print Sudoku book in my list. We also have to accept that as we age, eye-sight diminishes and so does our focus – this makes an excellent option for the older Sudoku-ist or anyone with vision problems. 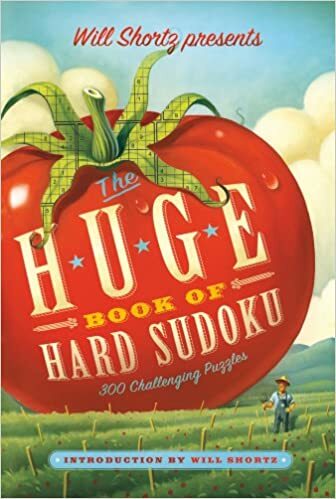 On each 8×10 page in this full-ring book there is just ONE Sudoku puzzle – amazing!!! The difficulty range of these puzzles would be great for someone with a bit of Sudoku experience, but they aren’t too hard to pick up and learn on the go as a beginner. This is my one fun inclusion on the list, Sudoku variants! So you’ve been doing the same format Sudoku puzzle and you’re looking for a fun new game that uses the similar principles. 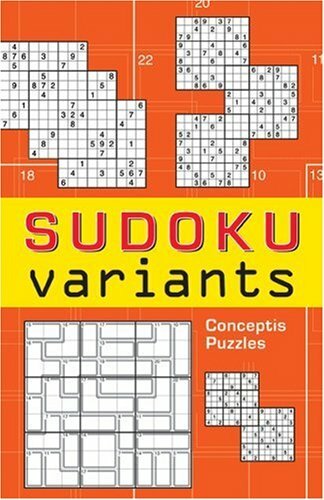 This book of Sudoku variants has different grid variations, funky shapes, and difficulties for every puzzler. Pick up this book for a fresh style of puzzle that will keep you guessing at every turn of the page. This book is an excellent gift for the un-expecting puzzler in your life who you know loves Sudoku or other paper puzzles. Daily online Sudoku – A really great option for solving a Sudoku each day online and having access to reviews, solutions, the whole shebang. You can even design and submit your own puzzles and share them with friends – awesome. Any who, Sudoku is a really great game and I hope that my reviews of the best Sudoku books will help you pick the right book for you or as a gift for a loved one if that’s your intent. Happy puzzling :)!